Palmer with another INT - he needs to snap out of his funk - but that was just a bad throw-up pass to CJ in double coverage. Well..that was kind of cool. Does anyone wanna tackle Mr.Vincent or are we just gonna let him have a nice return. It looked like the guys were just half assen. Well, Johnson had Clements beat, it was just a bad throw. 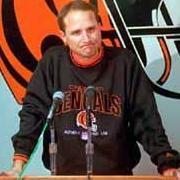 The Bengals look unmotivated and flat so far. Disappointed in Palmer right now, he needs to get his head out of his a$$. This is lookin real bad. We need to step our damn game up. Another example of Carson trying to force the ball to Chad. That was the most pathetic flea-flicker i have ever seen..
Well Bills brought there A Game. Think the Bengals might be too far up in the air right now. Even ther Bills have been known to get leads and lose them ! Holy crap..Reed caught the ball???? All you have to do is just stand there and get in the way to shut down our run game. Yeah gotta wonder if they're going to just sit Deltha and Odell and TJ for the game at this point. No reason to risk not having them for the playoffs. We may have to suffer through two losses here and that won't be easy to take, if they also lose in the 1st round of the playoffs, what a sour note to end this season on. Need to pull this one out today as a result.